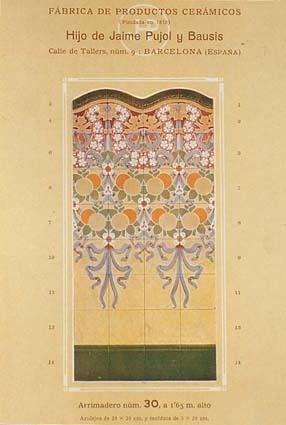 During the period of Art Nouveau, the architects were expanding its scope, since its initial function toward the project and direction of the construction, until assuring also a coordination of the exterior and interior decoration, activity evolving to an essential element of its work. It is known that often a building is defined as Art Nouveau more by its decoration that by its structural characteristics. This gave an extraordinary importance to the ceramics being one of the most used decorative elements. 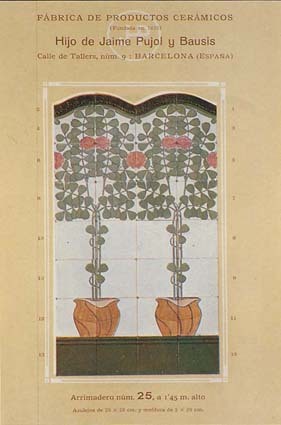 Really, the Art Nouveau character of a building does not given by the design or the techniques utilized, but by the ornamental elements decorating their facades or their interiors. The decorative elements as the pavements, the stained glasses, gypsum, stone carved, the locksmith and, above all, the ceramic coverings, are determinants to attribute this art nouveau character to a building. 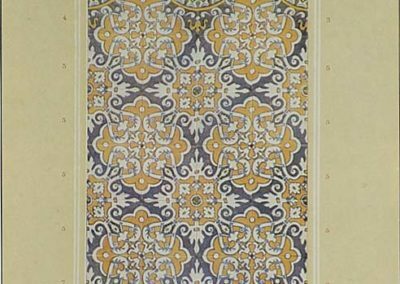 The sketchers and decorators, therefore, have a very important role (along with the architects themselves) in the ornamental design process. This role has been historically undervalued, but more is discovered every day about the worth and the very important role that these artists developed thanks to the work of numerous researchers specializing in this field. We refer to figures such as Alexandre de Riquer, Adrià Gual, Lluís Brú, Mario Maragliano, Joan Baptista Alós or Francesc Quer, to say nothing of the very important contributions in this field of architects such as Gaudí, Domènech i Montaner, Font i Gumà, Puig i Cadafalch, Gallissà, Raspall, and many others. 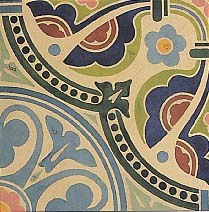 Many bold experiments with painting and color on ceramics were made during the Art Nouveau period, in stark contrast to the academic and rigid nature of eclecticism – against which Art Nouveau was a reaction – that led to among other things the artistic revival of exterior decoration (Batlló House, Palau de la Música, etc. ), and most importantly the interior decoration (Institut Pere Mata, Hospital de Sant Pau, Palau Güell, etc. ), of buildings. 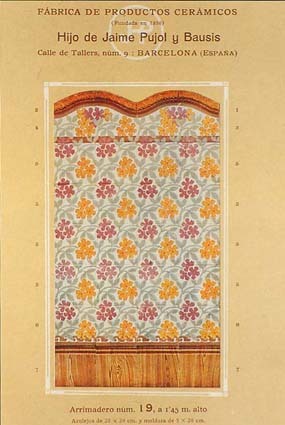 Within this decoration there is an intense application of ceramic inlay. 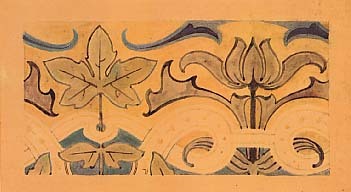 The combination of art and industry, situated within the ideology of the Arts and Crafts movement and aided by the technical advances of the second half of the nineteenth century, allowed for the elaboration of extraordinarily creative and innovative models and their widespread application. The workshop known as the Castle of the Three Dragons, founded by Lluís Domènech i Montaner, was a pioneering initiative created with the goal of recovering older (ancient) arts and methods, among them ceramics, to be applied to the new architectural style of Art Nouveau. The workshop was created on the heels of the World’s Fair of 1888, the most important development in late nineteenth-century Barcelona. Once the Exposition closed, demolition of its temporary pavilions and buildings began. However, some were preserved, among them the Café-Restaurant of Domènech i Montaner, popularly known as the Castle of the Three Dragons. Since the building had not been finished for the Exposition, the City Council charged Domènech with turning his Cafe into a Museum of History. 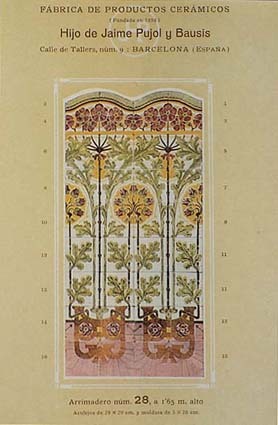 Domènech accepted the offer, and to complete his task, he finished the tallest tower – the Tower of Homage – the decoration, and other necessary modifications. 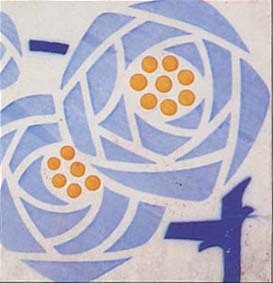 A decisive development for the future of Catalan Art Nouveau was the establishment of many artists who would later have an important presence, such as the sculptor Eusebi Arnau, the glassmaker Antoni Rigalt, or the ceramicist Pau Pujol i Vila (factory Hijo de Jaime Pujol i Bausis), and the architects Gallissà and Josep Puig i Cadafalch. All the artists mentioned had an interest in reworking the methods used by the old master craftsmen, to recover them, adapt them, and apply them to the Art Nouveau architecture that was beginning to take flight. The contacts made between these artists and artisans would prove highly beneficial, allowing them to share experiences, discuss ideas, and develop models. 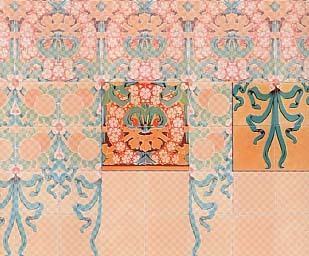 Many ceramicists worked on the renovation of the Café, including Pau Pujol i Vila, Baldomer Santigós, and Josep Ros, the latter of whom helped advance the ceramic technique of lustre painting to achieve a metallic reflection. 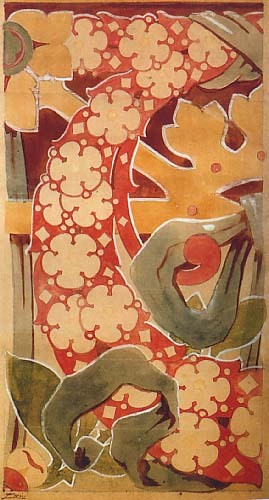 Unfortunately, the Three Dragons workshop ended once the Museum of History was installed in the Café, proving a short-lived experiment in Art Nouveau collaboration. All the knowledge accumulated during the conversion of the Café is today present throughout Catalunya, in hundreds of buildings by Art Nouveau architects – Gaudí, Domènech, Puig i Cadafalch, Gallissà, Font i Gumà, Bassegoda, Jujol – which are in many cases still well-preserved and with a beauty justifiably inscribed in the history of Catalan art. 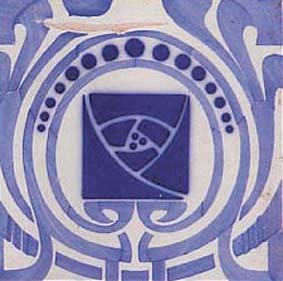 The abundance of information remaining on the Pujol i Bausis factory has permitted the reconstruction of the origins and destinations of a majority of the ceramic production of the era to such an extent that today it is possible to know which artists and designers collaborated with the factory in decorating a large number of Art Nouveau buildings in Catalonia. An attempt has been made here to differentiate between the role of the artists (architects and design sketchers) and that of the manufacturers, despite the fact that the lines between the two are often blurred and the technical and artistic viewpoints often overlap. The base to be decorated generally consisted of clay tiles in various sizes (calcareous clay or ferrous clay). 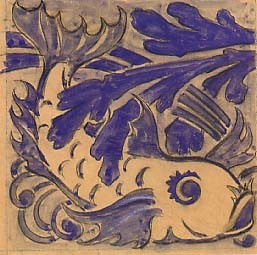 After being fired, a coat of oxides and colorants is laid over the tile base. A second firing seals in the colors with glaze. If the clay base had a transparent glaze applied, the tile would keep its dark brown background. Therefore, a white glaze of tin oxide and other elements needed to be applied to the clay after the second firing. 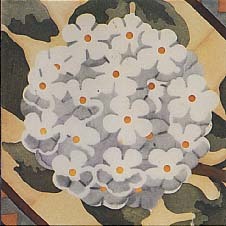 Over the resulting white surface, different colors of paint could be applied by using a trepa (stencilled sketch), by hand or by hand with an estergit (silhouetted stencil). 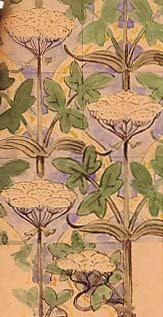 The tiles were generally fired in Arab kilns. The drawings done by artists, architects (Domènech i Montaner, Antoni Gallissà, Puig i Cadafalch, etc. ), or design sketchers (Lluís Brú, Joan B. Alós, Francesc Quer, etc.) were handed over to the factory, which produced the estergit, a piece of paper with perforations corresponding to the intended design. The paper served as a stenciled sketch which the factory workers then sprinkled with carbon powder to trace the drawing. This procedure was normally used to create unique, one-off tiles and tiles that would not be repeated frequently. Another method of transferring drawings to tiles was by using a trepa, waxed paper with the design to be transferred cut into it like a silhouetted stencil. This procedure was used to mass produce tiles. Finally, a method called the aresta (edge) or conca was also used, in which the design was cast in a plaster mold with the outlines in relief (imagine making a stamp template). 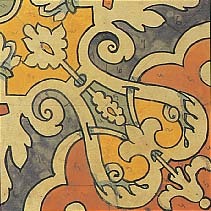 The raised lines prevented the colors from mixing, which made painting the tiles easier. 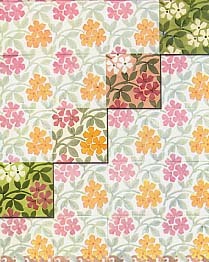 Tiles with repetitive themes could infinitely reiterate a design. They were used most frequently in doorways, stairways, passageways, and similar places because of their great beauty and hygienic quality. One common example is their use in arrambadors (supports). They allowed for multiple variations on a single drawing, simply changing the color, the intensity, the background, etc. One little-known technique totally different from ceramics, but with the same applications, was the cardboard lithograph. 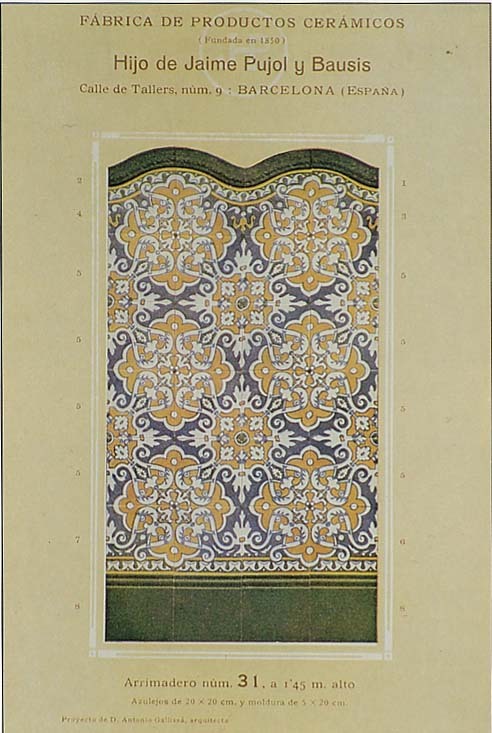 Hermenegild Miralles developed this technique with some commercial success during the first years of the twentieth century.